Carrots, broccoli, various hand-made onigiri, shrimp, and as a treat, an apple-flavored kon'yaku jelly. Anthony's mid-year class started having bentos last week, but on the occasion of the big day for his new schoolmates, I thought I'd post today's bento. 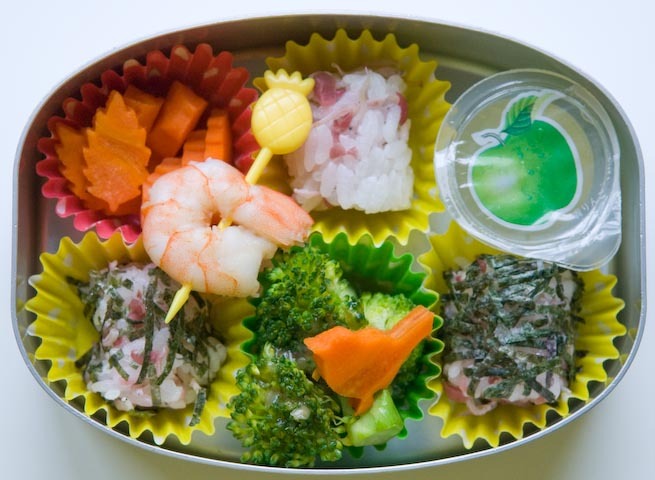 It seems Fumie was inspired by a hanami bento, which has many small items, allowing for particularly easy, leisurely consumption. Of course, he ate it all up.